APC mini - Compact Ableton Live Controller is rated 4.5 out of 5 by 4. Rated 5 out of 5 by Anonymous from Amazing Ableton controller Compact, easy-to-use and simple to setup. 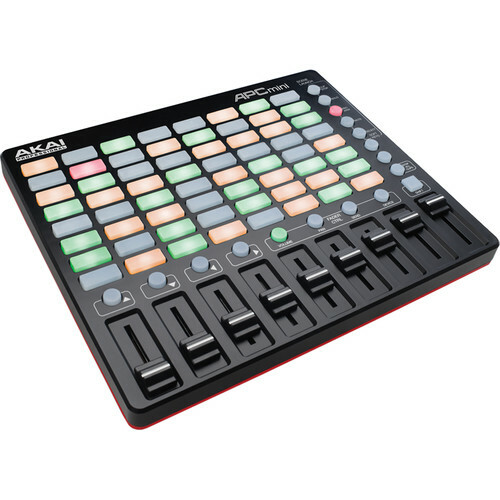 Before buying I would highly recommend to watch official Akai video on YouTube, which explains the workflow. It's a one-button-does-different-things controller. For example, clip stop and arm record modes are separated and require switching with Shift button, which may not fit, if you need to switch your midi keyboard between different instruments all the time. I use it for live looping, clips management and live synth improvisations (along with LPD8 and midi keyboard) - so it's a perfect match. And price is very competitive. If you don't need velocity-sensitive buttons like in Push - it's a very good cheaper alternative. Customization is not trivial and not provided out of the box. Rated 3 out of 5 by BuleriaChk from No Session Overview This unit does not include Session Overview, which makes it useless for those that organize their sets in banks (e.g., using Push).Other than that, Mrs. Lincoln, how was the play? could this controler be used with photoshop lightroom premire cc? Using the MIDI learn function, you may assign any MIDI controller to manipulate the various parameters within lightroom.